Researchers estimate withholding of pipeline capacity cost New England electricity customers $3.6 billion over the past three years. Eversource called the report a “complete fabrication." A new academic analysis argues gas utility subsidiaries of Avangrid and Eversource have artificially constrained gas pipeline capacity in New England for years, driving up natural gas and electricity prices and potentially violating federal laws. The systematic withholding of pipeline capacity, particularly on the coldest days, has cost New England electricity consumers $3.6 billion in higher prices over the past three years, according to “Vertical Market Power in Interconnected Natural Gas and Electricity Markets," a new white paper. A group of university researchers working with the Environmental Defense Fund found that local gas distribution utilities owned by the two holding companies regularly scheduled more gas than they needed on the Algonquin Pipeline in Connecticut and Massachusetts, only to cancel some of the orders later in the day — too late for the pipeline space to be resold. This practice, referred to as down-scheduling, “essentially locks up some pipeline capacity,” said Matthew Zaragoza-Watkins, an assistant professor at Vanderbilt University and co-author of the report. On the worst days, including during the Polar Vortex of 2013-2014, up to 7% of Algonquin’s capacity could be artificially constrained. “When you relate that back to gas-fired generators, that’s about 28% of the gas that would be demanded,” Zaragoza-Watkins said. Utility officials denied any wrongdoing, saying their gas scheduling practices are to meet customer needs. Eversource called the report “a complete fabrication” and denied engaging "in any behavior to underutilize capacity to 'artificially constrain capacity.'" "The pipeline capacity we reserve is done so to meet the needs of our customers, no other purpose," Media Relations Manager Tricia Taskey Modifica wrote to Utility Dive. Avangrid officials said they have not yet reviewed the report's findings, but the company's gas scheduling practices are "to help protect customers from interruptions —including during unpredictable, extreme weather conditions," Vice President for Corporate Communications Michael West wrote in a statement. It does not appear either company broke any contract laws or market rules with their behavior, researchers said. But if the report’s findings are accurate, industry lawyers say they could amount to violations of federal law — and become one of the biggest price manipulation scandals since the California energy crisis. The motivation behind Eversource and Avangrid’s gas scheduling behavior remains unclear. Researchers say neither company’s gas utility subsidiaries stood to gain significantly from the practice. But other divisions of the utility holding companies — such as power generation or pipeline construction — could see indirect benefits from higher power and gas prices as a result of capacity withholding. Regardless of the motivation, researchers and energy analysts say the report points to deep issues in the structure of gas markets that can create “perverse incentives” for market manipulation by large utility holding companies. Reforming the gas market to more transparently value pipeline capacity service, they say, could ensure this sort of withholding does not happen in the future. In the study, set to be submitted to academic journals in the coming days, researchers analyzed hourly scheduling data for the 117 delivery nodes on the Algonquin Pipeline over three years. Their scrutiny revealed “systematic discrepancies” in pipeline scheduling and deliveries, Zaragoza-Watkins said. “They would essentially schedule all of the capacity they needed at the nodes, pretend they were going to use it, and then at the last moment they would down-schedule pretty substantially — in the order of 25% to 50% of the capacity that was scheduled to go to those nodes,” he said. The affected nodes were disproportionately served by what is referred to as “no notice” contracts, which allow utilities to alter gas scheduling without penalties for imbalancing the pipeline flow. The shippers avoid penalties by “reducing their scheduled quantity at the last moment, such that their final scheduled quantity matches what they actually flowed,” researchers wrote. 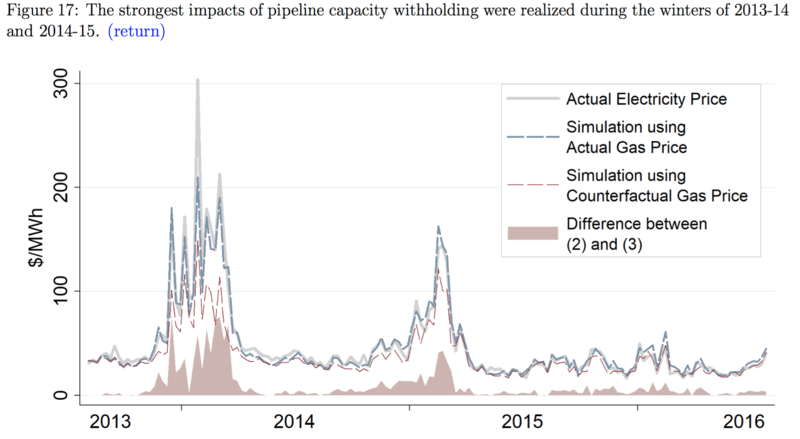 This pattern of withholding increased during the winter months when higher gas demand for heating and power generation puts more strain on pipeline capacity, according to the researchers. Avangrid withheld gas capacity on a more regular basis throughout the year, while Eversource tended to “turn on” its policy at the beginning of the winter and then cease in the spring. Across the entire system, system adjustments in the final three hours of the gas day averaged -48,493 MMBtu over the three-year study period, but -51,152 MMBtu in the winters. The down-scheduling was most apparent, however, on the very coldest days — including during the Polar Vortex, when gas demand was already highest and pipelines were most constrained. “On 37 days during the study period, aggregate adjustment exceeded -100,000 MMBtu,” researchers wrote. Compared to what they figure gas prices would be on Algonquin without withholding, researchers found that prices were $1.68/MMBtu (or 38%) higher over the entire period of the study and $3.82/MMBtu (or 68%) higher during the winters in particular. Natural gas accounts for about half of power generation in ISO-New England, meaning gas prices have a strong influence on the power market. The researchers estimate electricity prices were about $10/MWh higher on average due to withholding during the study period. Much of that differential was driven by the Polar Vortex, when power prices were “$40.67 (51%) higher on average due to capacity withholding,” researchers wrote. During the 2014-2015 winter, power prices were 28% higher than they would have been. In 2015-2016, prices were 13% higher. Weissman, who also runs the energy analysis firm EBW Analytics, said the report’s findings are consistent with expected market reactions to constrained pipeline capacity. “There’s no question that when you get to these really tight conditions, a 1% or 2% increase or decrease [in gas supply] can have huge implications on both natural gas and electricity prices,” he said. Weissman and a half dozen other energy lawyers, former regulators and analysts endorsed the report’s approach, though they cautioned that verifying the results will take more time and analysis. “That's a question there were never was a good answer to, other than vague scheduling issues,” he said. “Eversource’s pipeline capacity is dedicated to serving our customers under state and federal regulations with no ability to withhold what is being fully utilized to serve those customers and to ensure reliable service on the coldest days," Modifica wrote. Pressed on whether Eversource engages in a down-scheduling strategy, Modifica said the company is not familiar with the term. "We do not engage in any behavior to underutilize capacity to 'artificially constrain capacity.'" "We do not engage in any behavior to underutilize capacity to 'artificially constrain capacity,'" she wrote. "Our focus and actions are driven by the necessity to ensure a reliable and reasonable gas supply for those customers that we are obligated to supply." during unpredictable, extreme weather conditions." "We enter these long-term contracts and operate them so that we have enough capacity for our customers," West wrote. "It is our obligation and requirement as a regulated local gas distribution company to provide a reliable source of gas service to our customers during even the most extreme weather conditions." Those statements do not contradict the central findings of the report, researchers said. "It is telling that Eversource does not challenge any of the specific findings in the research,” said N. Jonathan Peress, senior director of energy market policy at the Environmental Defense Fund, who worked with the authors on the new paper. “It is very clear that repeated last-minute scheduling changes by Eversource and Avangrid reduced the effective capacity on the Algonquin pipeline by an average of approximately 50,000 MMBtu." While Modifica and West did not address the report's central findings directly, both said their utilities would have little incentive to withhold pipeline capacity. “Our gas distribution business is carefully regulated and the gas supply we purchase for our customers is a strict pass-through cost — meaning we don’t benefit from higher prices derived from withholding,” Modificia wrote. The report notes the same point: Eversource and Avangrid did not stand to gain significantly from reselling excess gas capacity on the secondary market because Connecticut and Massachusetts require nearly all of those revenues to be returned directly to ratepayers. In fact, researchers say capacity withholding was greatest in Massachusetts and Connecticut — states with the most stringent rebate rules for secondary gas sales. That finding prompted researchers to look at whether other markets could be affected by the behavior. Researchers behind the vertical market power report stressed their analysis seeks primarily to identify the act of capacity withholding itself, and the findings do not ascribe a motive to the utility behavior or suggest either company gained financially from the practice. Even so, the researchers and outside experts said the structure of utility holding companies, with multiple affiliates in different sectors of the gas and power markets, may have offered opportunities for Eversource and Avangrid to benefit from such down-scheduling. At the same time that Avangrid and Eversource were engaging in capacity withholding, “these same companies with other affiliates were in front of our commission asking us to approve billions of dollars of additional pipeline capacity,” the former Maine regulator said. "[The utilities] were asking for additional pipeline capacity during a time when existing pipelines weren't being fully utilized ... so the whole thing is troubling." Eversource in particular is active in the pipeline construction business and earlier this year pulled out of construction for the controversial Access Northeast pipeline after a court ruling in Massachusetts prevented it from charging electric ratepayers for its construction. “It is well documented that New England pipeline demand greatly exceeds the supply on cold days,” Modifica argued. In fact, the question of pipeline capacity is a common point of contention in New England. Utilities and ISO-NE have funded and published reports arguing for more pipelines, but other studies, such as one published by the Massachusetts Attorney General, say utility reports use unrealistic gas demand forecasts and argue new pipelines are unnecessary. As recently as February, Eversource and activists traded barbs over a study from Synapse Energy Economics that argued the Access Northeast pipeline is not needed. The latest report's findings cannot conclude on their own that Eversource and Avangrid had pipeline construction in mind when they withheld capacity, but Littell said it points to the larger issue of how gas markets are structured. “The rules seem to create perverse incentives for actions that cost ratepayers a significant amount of money and actually support requests for billions of dollars in additional gas pipelines that may not be necessary if the markets can be made to function more efficiently,” he said. Beyond the incentive to encourage favorable conditions for pipeline construction, Zaragoza-Watkins said the downstream electricity market, where both utilities own plants, “presents some opportunities to earn increased revenues” through capacity withholding. By restricting the sales of gas to other generators, “the capacity-withholding firms increased the quantity of electricity their largely non-gas units were called upon to generate and the price those units earned,” researchers wrote. The connection, however, is not direct, said Levi Marks, a PhD student at the University of California, Santa Barbara, and a co-author of the report. The generation the two utilities own is largely under cost-of-service regulation, meaning they would not receive a direct revenue increase due to higher power prices. Avangrid owns about 70 MW of unregulated wind generation in the area as well as about 200 MW of dual-fired peaking generators that are listed with oil as their primary fuel source, Marks said. Eversource owns more than 1,100 MW of regulated generation in the region, including three major fossil fuel plants in New Hampshire. Higher gas prices and perceived pipeline constraints could make these non-gas units appear more necessary to ensure reliable power and affordable prices in a tight ISO-NE market dominated by gas, researchers said. And it could bolster the finances of those plants in front of regulators. “If you’re the utility owner of these resources and can say to your regulator, on the coldest days, we earned a $17/MWh margin [for example] that's getting returned to the benefit of ratepayers,” Peress said. There may be a more direct connection in Eversource’s case. Last summer, the utility struck a settlement with stakeholders in New Hampshire to sell off its three fossil fuel plants in that state — the coal-burning Merrimack Station, dual-fuel Newington Station and Schiller Station, which can burn oil, coal and biomass. The deal capped a plant deregulation push in the state that dates back to 2002, the Union Leader reported at the time. The sales process for those plants is ongoing, with bids delivered this spring, while researchers said Eversource could benefit if power and gas prices are higher in the region. Researchers stressed that their findings do not aim to ascribe motive to the utilities or the debate over the need for new pipeline capacity in New England. If the findings of Marks, Zaragoza-Watkins and their colleagues are verified, observers say they could have significant consequences for the markets and legal ramifications for the utilities. The Federal Energy Regulatory Commission (FERC) is likely already aware of the issue, said former Chairman Jon Wellinghoff. Peress said he has made FERC aware of the data in the report, but the commission said it does not comment on outside reports and neither figure knew whether it had opened an investigation. If FERC takes up an investigation into capacity withholding and concludes market manipulation has taken place, it could order a halt to the practice, impose fines and issue rebates to customers, Wellinghoff said. "Whether this particular analysis is right or not, it certainly suggests there is a need for much more focus on getting the rules and the tariffs accurate and better structures as the entire nation moves toward higher levels of gas dependency." The latter point is one a number of observers urged FERC to take up. Beyond the impact of Eversource and Avangrid’s actions, Littell expressed concern that the report points to deeper issues in the structure of gas markets. Peress and the university researchers agreed that the findings point to the need for a rethinking of the gas market. A new policy paper from EDF, also published today, advocates for a system where gas capacity is contracted more often throughout the day, putting a more exact value on pipeline capacity and ramping needs for gas plants. Wellinghoff and Littell said that approach could help ensure this sort of capacity withholding does not happen again, and the new findings could help push the issue at FERC. Correction: An earlier version of this piece incorrectly stated that the EDF study was posted by the Massachusetts Institute of Technology. That reference has been removed and the piece has been updated to include comment from Avangrid and clarify a comment from N. Jonathan Peress.